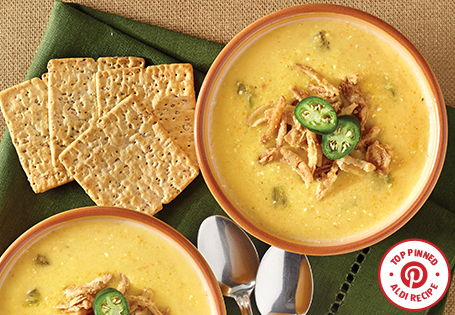 A spicy, creamy and crunchy soup reminiscent of your favorite appetizer! Place jalapeños on grill and roast for 10 minutes or until skin is charred. Rotate frequently. Place jalapeños in a glass bowl and cover with plastic wrap. Let rest for 10 minutes. Meanwhile, in a medium pot over medium heat, melt butter. Add onion, garlic, carrot and celery and sauté for 7 minutes or until tender. Deglaze pan with wine. Transfer contents to blender, add 1 cup chicken broth. Remove skin and seeds from jalapeños. Place 2 jalapeños in the blender and blend until smooth. Return to pot. Dice remaining jalapeños and add to pot with remaining stock. Bring to a boil. Whisk corn starch and water until smooth. Add to boiling soup, stir until thickened. Add cream cheese, simmer over medium heat until cheese is melted. Add cheddar cheese and stir until melted. Season to taste with salt and pepper. Serve with French fried onions and additional jalapeño slices if desired.